Crafters are pretty cool people. Not only do they make creative things but they are also very generous. A while back I had seen a Twitter post from a fellow crocheter who spent the last year making cute, geeky amigurumi to hide at a con she was attending leaving each one with a note to tag her on Twitter to see where her creation would wind up in the world. I just thought that was the coolest thing and vowed that I would do the same. So I had planned on doing all these great amigurumis for Gen Con but then procrastination and a general lack of desire to crochet took hold. The months passed and I still hadn’t made any amis as Gen Con just got closer and closer. Then, a bit of inspiration happened with the release of a mobile game called Pokemon GO. 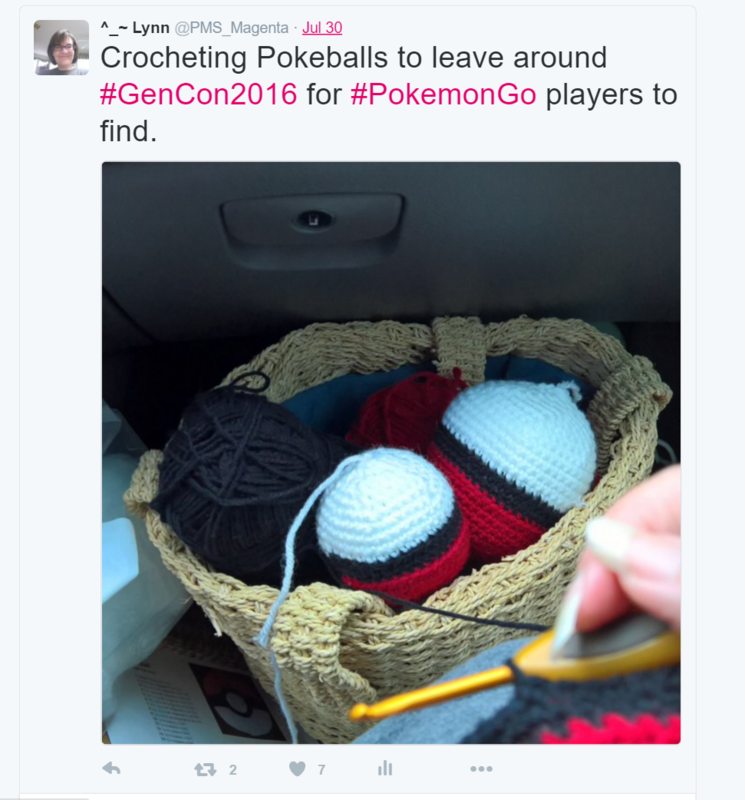 I could crochet Pokeballs for people to find. Pokeballs are basically a ball made up of three colors – red, white, and black – with the white and black button in the center. I had all the colors in my stash and could easily buy more if I ran low on the long car ride to Gen Con. 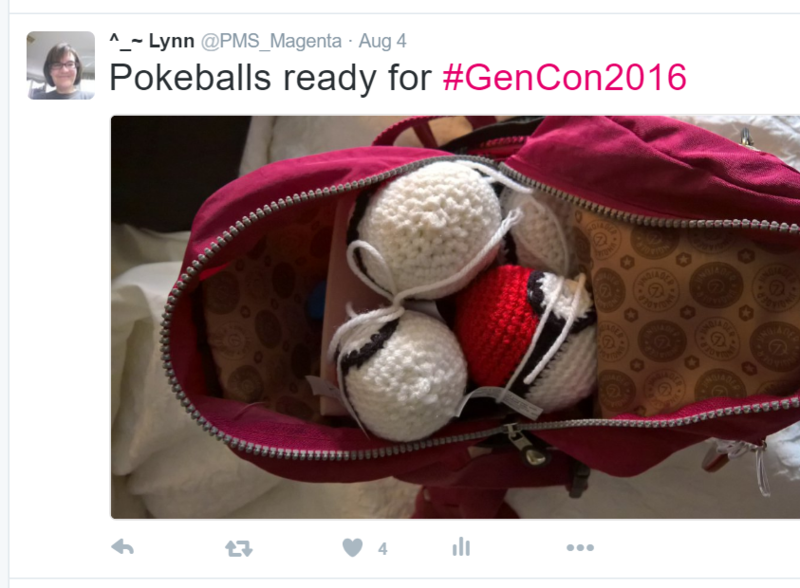 So our journey to Gen Con began and so did the crocheting. I tweeted it out and realized the power of the hashtag as I quickly had two likes! 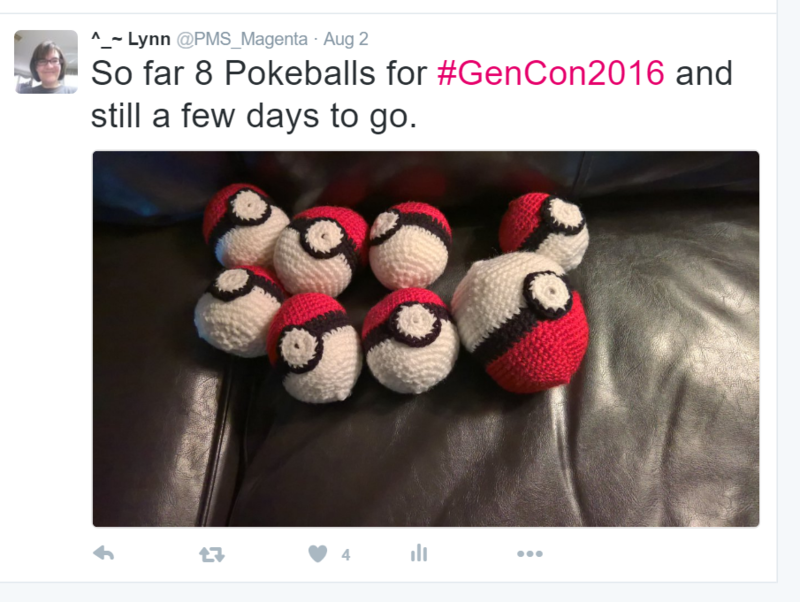 I continued to crochet Pokeballs and halfway through our journey I was up to 8. Our trip took so long because we made a few stops to pick up the rest of our crew. By the time we rolled into Indy I had 16 and decided to stop there meaning that we could hide four pokeballs a day. We concentrated on places that were Pokestops to increase the odds a player would find them but really it seemed every other person was swiping their phone to catch Pokemon all over the convention center. It was so much fun to hide Pokeballs and then to see people find them. Good stuff. We did get a few tweets back from those who had found them which was awesome. Some Pokeballs we did give away to kids dressed in Pokemon attire which was too much fun. I will definitely do this again next year. It was a blast from crocheting for hours in the car to hiding the balls to reading tweets from others. I will be doing more Pokeballs for PaxSouth in January. I can’t wait to get started.